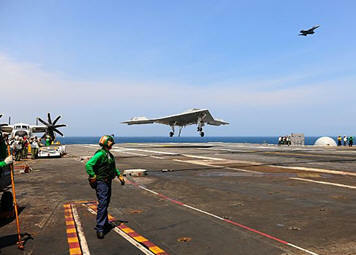 July 10, 2013 – Today, the X-47B Unmanned Combat Air System (UCAS) demonstrator completed its first carrier-based arrested landing on board USS George H.W. Bush (CVN 77) off the coast of Virginia. "It isn't very often you get a glimpse of the future. Today, those of us aboard USS George H.W. Bush got that chance as we witnessed the X-47B make its first ever arrested landing aboard an aircraft carrier," said Secretary of the Navy Ray Mabus. "The operational unmanned aircraft soon to be developed have the opportunity to radically change the way presence and combat power are delivered from our aircraft carriers." During today's testing, the X-47B completed the 35-minute transit from Pax River to the carrier and caught the 3 wire with the aircraft's tailhook. The arrested landing effectively brought the aircraft from approximately 145 knots to stop in less than 350 feet. Shortly after the initial landing, the aircraft was launched off the ship using the carrier's catapult. The X-47B then proceeded to execute one more arrested landing. On the third approach to Bush the X-47B aircraft self detected a navigation computer anomaly that required the air vehicle to transit to the assigned shore based divert landing site, Wallops Island Air Field. The X-47B navigated to and landed without incident. "We have been using the same [carrier] landing technology for more than 50 years now and the idea that we can take a large UAV and operate in that environment is fascinating," said Engdahl.